Is study leave anxiety a thing? I put off applying for mine last year at the last minute, telling a colleague to go ahead and submit her application instead of competing with her (we only have space for one to go every year). I had doubts about the quality of my research idea (having to do with librarianship and motherhood) and decided it wasn’t enough to carry me through for the full year. So this year it was my turn to apply, and as the only applicant I didn’t have anyone else to defer my spot to – if I didn’t apply, no librarians would be on study leave next year, and while that might be wonderful in terms of workload issues (those remaining absorb the person on leave’s duties for the year) I fear repercussions of us not continually taking advantage of this benefit. Leona Jacobs, a retired colleague from the University of Lethbridge, noted that many librarians are reluctant to take advantage of their study leaves; in her research presented at CLA 2007, If it is negotiated, will it be used? An investigation into the use of sabbatical leave provisions by librarians, Leona reported that in 14 years, only six librarians at the U of L had taken leaves; five of these were educational. She turned her own anxiety about ‘what to do’ into the research project itself; brilliant! And also good to know that I wasn’t alone, though her research suggested that ‘my’ generation of more recently-minted librarians were more likely to take advantage of study leave benefits. Perhaps I am in the minority after all. Certainly when I got this job, the potential for a year’s leave was a huge incentive. I had fantasies of moving to Europe for a good part of it, with no actual idea of what the research would be but certain I’d come up with something by the time I was eligible. In the meantime I got married and had a child, so the prospect of relocating for a leave became much more logistically difficult. My enthusiasm for the leave took a nosedive, especially with no ‘great ideas’ on the horizon. Regardless, I did apply this round, with a different project than I had in mind last year. This time, it’s to analyze two years’ worth of two-year-old qualitative data collected from student journal reflections on info lit labs, determining whether or not the students crossed the ‘threshold’ of understanding regarding the various ACRL Frames. I will use it as an opportunity to learn NVivo and the art of qualitative research, and to finally get to the analysis of these reflections which have been sitting gathering dust on my filing cabinet. However, even as I was filling in the submission application (at the very last minute! ), I was once again filled with doubt. Do I care enough about this to last me the year? Is it enough work to fill the duration of the leave? I’m so used to doing research ‘off the side of my desk’, I have no idea what a full-time research load might look like. Or feel like. Will I be so sick of this project after two months that I will dread the remaining ten? What about missing my normal daily work? I also have serious FOMO – what kind of changes will occur in the library during my absence, both good and bad, that I may miss out having a say in? I also have circled back to the librarianship and motherhood idea; I presented a brief summary of the state of the literature at CAPAL18 and was met with enthusiastic responses on the need for more research in the area. [In brief: much exists on academics and parenthood; very little exists on academic (or any kind of) librarians and parenthood, and even the stats are hard to come by]. So now I wish I’d submitted my application to do a full study on this, and at the very least try to edit a compilation of articles written on the topic (realizing full well that it’s much more work than I might anticipate, as reported by Maha Kumaran & Tasha Maddison in their presentation, Contracts, Contributors and Conflicts: Working with Publishers and Chapter Contributors at the C-EBLIP 2015 Fall Symposium. So here I am. Info lit-related proposal submitted and accepted; leave to start July 1, 2019. I am simultaneously happy and terrified. Can I decide at the last minute (well, at least before our 2019/2020 assignment of duties are finalized) to not go? Will I enjoy it so much I never want to come back to my regular job? Will I be bored silly by my topic? Will I wish I’d done the motherhood topic instead? If I do decide to at least try an edited volume around motherhood and librarianship, will I get any submissions? (yes, that’s a hint – let me know if you’re interested!). Can I possibly do both in a year (without working even more than I normally do)? This article gives the views of the author and not necessarily the views the Centre for Evidence Based Library and Information Practice or the University Library, University of Saskatchewan. I have the great fortune to be on a one-year sabbatical. I love to learn, and I’ve moved out of my comfort zone by doing more qualitative research. I am interpreting a lot of open-ended comments from many interesting people, and have gone from being overwhelmed to kind of/sort-of comfortable in the mounds of data I’ve collected. I really do appreciate and love the learning. So, a little story: In late spring, I was helping my 11-year-old son with his homework to find the surface area of triangular prisms. After watching some YouTube videos, we eventually started working through a practice sheet until he finally got the hang of it. While working on some problems myself in order to help him understand, I had a bit of an epiphany: I miss math. You see, in “real life” I’m an assessment librarian. This started as mainly collections assessment, and eventually broadened to also include service and space. If anyone ever thought that they would like to become a librarian to avoid math, they best not be working in collections, administration, or assessment. I do math all the time in my job. Does it drive me crazy sometimes? Yep. But I like it- I’ve always been pretty good at it. For the most part, my research so far this year does not include much math. And that’s ok; It doesn’t work for what I’m trying to do at the moment. I have been stretching out of my comfort zone, treading my way through to learn new skills. I guess this is nothing new- I get out of my comfort zone a lot in my regular job too (ie. I never knew I’d use Excel so much). With learning any new skill, there are overwhelming moments- the “what have I gotten myself into” kinds of moments. They are happening less and less now, but I sometimes find myself comparing this sabbatical to my last one in 2010. At that time, I was just getting used to the idea of doing research at all. One of the things I did was a bibliographic study on graduate biology theses at Carleton University (shameless plug here: http://www.istl.org/11-winter/refereed3.html). There was lot of math involved. It was a very new process for me and I’m sure I had my doubts at the time, but I also remember saying out loud “I LOVE this”. Not that I’m NOT loving what I’m doing now…I’ve certainly had my “ooh” moments…. I just find it more…difficult maybe? I love Selinda Berg’s blog post (https://words.usask.ca/ceblipblog/2016/03/22/capacity-not-competencies/) focusing on capacities for research- not just research competencies. I have to keep reminding myself that this is a learning process. I’m definitely growing as a researcher. I remember being part of the Librarians’ Research Institute (2014) (http://www.carl-abrc.ca/strengthening-capacity/workshops-and-training/librarians-research-institute/). Although I can’t find it in my notes (and I still refer to them 🙂 ), I do remember us talking about choosing research methods to answer your questions- understanding the advantages and disadvantages of choosing quantitative, qualitative, or critical/theoretical methods. In the end though, someone said you do have to feel comfortable with your choice of research method. As an example, if you are a complete introvert, you have to ask yourself if you really want to conduct focus groups or interviews. Just how much do you want to get out of your comfort zone? I’m happy to be out of my comfort zone, but I have also learned that when I’m looking at future ways to answer my research questions, I need to remember my strengths and skills that I do have. I purposely did not say “weaknesses” because those are the opportunities to learn. I do think that librarians can sometimes be a little “judgey” about some methods (ie “not another survey”) and this is not helpful. Ultimately choose the research method that is right for your research question, and when weighing the pros and cons of each method, remember your strengths and the learning curve that might be involved. Next time (if it makes sense to do so) I know that I won’t necessarily leave math out of the equation (bad pun intended). The first few weeks of sabbatical – Time to focus! I’m lucky to be in the beginning weeks of a one-year sabbatical. This is my second sabbatical, and I seem to be approaching this one a little differently than 7 years ago. Unlike my first sabbatical, I started this one with a once-in-a-lifetime family trip to New Zealand. Although it was mostly a holiday, I did have the opportunity to meet and discuss all-things-library with Janet Fletcher and some of the lovely staff at Victoria University of Wellington. I love seeing how other libraries do things, and our discussions really helped me to focus on my particular research. I was also able to discuss my research focus with family in Wellington, and really appreciated how I can apply their non-library perspective to my own work. Knowing that I was taking this holiday, I did a lot of initial research pre-sabbatical (ethics approval, survey implementation) so that when I returned, I’d be able to immediately sink my teeth into the analysis. This is different than my first sabbatical, where I started work right away. So what have I learned so far in my second sabbatical? I will readily admit that I probably have more questions than answers at this point, but I do have some tidbits of what to watch out for…. I know, I know – we know this – but it’s tricky sometimes! I find this very easy to do while on vacation, but the combination of jet-lag and arriving back just in time for a lot of turmoil south of the Canadian border made it very difficult to focus my first week back. I’m finding staying off social media a little more difficult this time around, but am aiming to limit myself to checking less often. I have school-age kids. I’m not sure if the winter weather was better the last sabbatical or not, but my kids seem to be around more because of storm cancellations or catching some sickness/bug. It makes it difficult to try and work during perhaps more “traditional” hours. I’m happy to be there for them, but finding that quiet time can sometimes be a challenge. I’m reading through comments from my survey. It was overwhelming at first- just sort of “swimming” in all the data, trying to figure out the themes and ways to code things. I’ve finally reached a breakthrough, which is exciting in itself, but even when I’m floundering I still just love it. I’m so excited for all of the things I’m going to learn this year. I MAY have taken on too much . Since I’m really at the beginning of everything right now, I’m still on the fence on whether or not this has helped my productivity. But it has been wonderful to give myself space between my work life and my sabbatical life- to have a chance to “let go” of some of the work-related things and to really focus. Which leads me to…. I found this very easy to do for my first sabbatical. Because I’m at a different point in my career now, I find myself checking my email *sometimes* this time around. But I try to limit it to infrequently getting rid of junk mail and catching up on major work-related news. Do you have any tips on staying focused? I would love to hear them. I’m excited and energized about what my sabbatical year holds! I’m just past the halfway point of a nine-month sabbatical (combined research/study leave), and reflecting on my experience so far has brought up two interrelated themes: adaptability and inspiration. These five months have challenged my ideas of what physical and digital environments are conducive to and motivational for my research and study, and I’ve been thinking about how to incorporate some of these new practices into my non-sabbatical work life come April, 2017. As a bit of a creature of habit, I like the office I’ve had for the past three years at Western Libraries, with its window, big desk, print books, and easy access to printing out PDFs of articles. While spending my research leave outside of London, Ontario, was appealing for a number of personal and professional reasons, I was also a bit apprehensive about not having a real home or office. A nomadic research leave also meant that printed material wouldn’t be practical (heavy to move around and harder to obtain). During this first part of my leave, I’ve lived and worked from four Canadian provinces, three US states, and three Costa Rican provinces (one of which I had to leave fairly quickly to avoid the country’s first hurricane in many years). These locations have been workshop and conference sites, homes of friends and family, and destinations for travel and exploration. The transitions between locations have become my new ‘weekends,’ and I’ve been happily surprised at how much easier the transitions became with repetition and practice. I’ve redefined ‘office’ as ‘wherever I am sitting with my laptop,’ and that’s been public libraries, kitchen tables, coffee shops, cabin patios, grassy hills, beaches, and hammocks. It’s now natural (and enjoyable!) 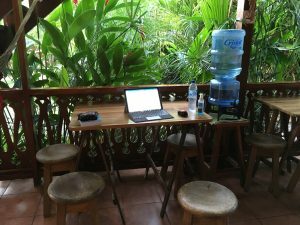 to work on my research from any location. I’ve also been really happy that a flexible schedule has worked well for me. The number of hours, days of the week, and times of the day that I’ve worked have varied enormously, to fit deadlines for papers, conferences, and abstracts; match my own personal preferences; adapt to schedules of family and friends; and to accommodate travel time. Creating schedules has helped with focus on a daily level, and with feeling confident about meeting deadlines more broadly. In terms of my digital environment, I’ve learned to tolerate (but not quite love) marking up PDFs of articles digitally. I’ve also bought and accessed e-books (somewhat begrudgingly), and I’ve appreciated being able to easily search the contents. What will I take back post-sabbatical? The freedom and time available for research during a sabbatical can provide for unique forms of inspiration. I’ve spent time in familiar and new physical locations, including the beautiful University of Michigan campus in Ann Arbor; the Maritime provinces as the autumn leaves changed around me; in beach, jungle, mountain, and city environments in Costa Rica; and at public and university libraries with lovely design, artwork, and views. I’ve been so grateful for the many travel experiences made possible by this sabbatical – it’s helped provide inspiration and increased my commitment to my research and study. I’ve also been fortunate to have conversations and chance encounters that have provided motivation and interesting directions to consider. While at the University of Michigan, I talked to Jeff, a doctoral student in higher education, about some issues around strategic planning and assessment in libraries; he immediately responded with ‘Isomorphism.’ We discussed this sociological concept and he provided me with a long reading list. It’s a fascinating topic that I’ll be able to use to help explain some aspects of libraries’ behaviours as organizations. While on a shuttle between locations in Costa Rica, I met Susanna, a doctoral student of aquaculture in Finland. 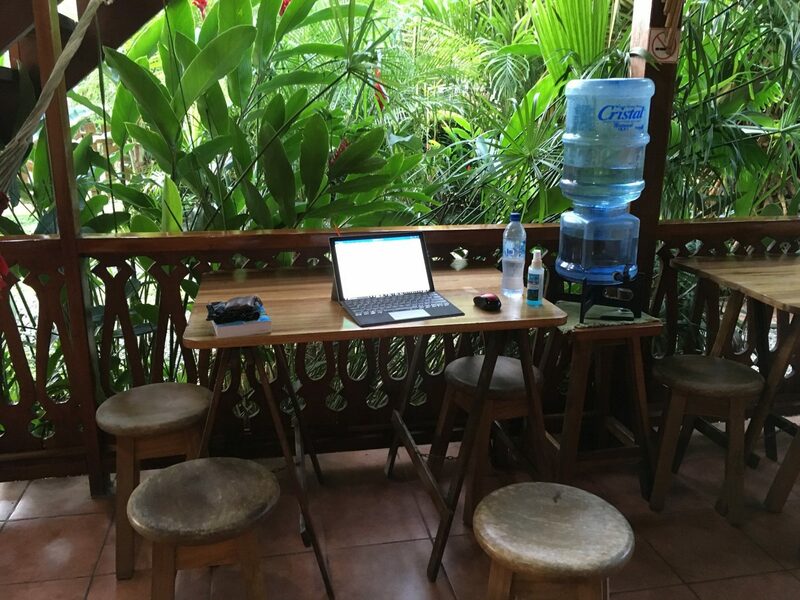 She was taking her own ‘mini’ research leave – one month in Costa Rica to inspire and push her through the dissertation-writing process. She asked me insightful questions that helped me reflect on my research topics and processes, and inspired me with her own writing goals and discipline. I’ve taken a number of guided hikes in Costa Rica from local and American naturalists, and learning about life strategies and life histories of different plants and animals from Sarah has inspired further thinking and reading about libraries as sociological organizations and their ‘life strategies.’ I’m not sure yet where this will lead research-wise, but I’m excited about it, and thinking about how biological and organizational behaviours are related has been fascinating. I highly recommend that librarians consider a sabbatical as an opportunity to travel and explore – you’ll learn a lot about yourself, and be inspired by the change in scenery and people you meet. This article gives the views of the author and not necessarily the views of the Centre for Evidence Based Library and Information Practice or the University Library, University of Saskatchewan. Ah, sabbatical. The term can conjure up many images to many people. Maybe yours is a vision of a quiet office at home with the whole day ahead to read some scholarly articles, wrestle with the mound of data you’ve been meaning to get to for months, and, perhaps, to write. Maybe you have plans to travel and present at a number of conferences. Maybe you want to spend some quality time with your collaborator and put the finishing touches on a project you’ve worked on for the better part of the past two years. Whatever your ideal there is a certain amount of planning that needs to take place before it can happen. I am on the cusp of my leave. At my institution, the University of British Columbia, it is called Study Leave and it “permits a member of faculty to pursue study or research, of benefit to the individual and the University…” (UBC/UBCFA, 2014). Planning has taken most of a year and had some unexpected twists and turns. I outline here some of the steps I took and hope it assists others planning their leaves. Different people will have different requirements and different goals. This only reflects my experience. My first step to securing leave was a conversation with my supervisor. This discussion had the dual purpose of notifying my supervisor I was thinking seriously about this request, but also of testing the waters with them. Would they be supportive of my request? Was this a good time, institutionally, for me to take leave, or could we negotiate a time that would be better? Was the topic I wanted to investigate one that not only interested me but one that would have benefit to the University when I returned? This wasn’t the only conversation, but it started the process in a very systematic way. It also started to identify the long (much, much longer) list of questions I would work through over the year. Planning covered the logistical requirements of being away from not only the workplace, but also leaving the country for a year, as well as beginning to develop the intended intellectual content of the leave (the real work of the leave). There were a few areas where these meld together, but, for the most part they occupied different streams of planning. Many people work at institutions where librarians have a long and established history of taking sabbatical or study leaves, and, because of this, the procedure is, if not clearer and simpler, then at least documented and standardized. My institution is 10 years old, and I am only the second librarian to take a leave, and the first librarian to take a 12 month leave in a completely different location. Because of this institutional youthfulness, it took effort to find the required forms, to determine whether I was completing them thoroughly enough, to track down the written confirmation of my leave (verbal confirmation arrived quite speedily), and to gather all the information I needed for the academic visitor visa application. On the intellectual content side of this equation my topic was clear to me right from the start: research data management. Here in Canada, libraries have been working on research data management supports for faculty and the intensity of the conversations on this topic have only been increasing. Libraries in the UK have been supporting their researchers systematically for some time because a number of their grant funding bodies have made research data management a condition to be met by researchers receiving funding. So not only did I have a topic (Research Data Management), but also a location (the UK). In preparation to delve more deeply into this I took two steps that laid a solid groundwork for my leave. 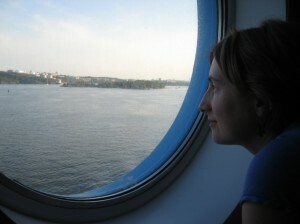 The first was to attend the Canadian Association of Research Libraries Librarians’ Research Institute in late June. The Institute gathers 28 participants and five mentors for a focused and intense look at doing the work of research from developing a research problem through methods, theory, data, writing and, finally, dissemination. I now have a set of great tools along with a supportive group of peers as I head into my leave. The second step I took was to contact librarians at my destination who have already been researching aspects of my topic to arrange for one-on-one meetings with them. All the people I approached responded positively and I am looking forward to some interesting and informed conversations after I get to the UK. The kernels of wisdom I hope you take away are to start planning early, be persistent and patient in equal measures, and develop a network of people outside of your workplace to sustain your momentum. I’m looking forward to a wonderful research adventure this year. University of British Columbia & The Faculty Association of the University of British Columbia. (2014). Collective agreement between the University of British Columbia and the Faculty Association of the University of British Columbia, July 1, 2012 to June 30, 2014. Vancouver, BC: University of British Columbia. Happy New Year, Brain-Work readers! 2015 is shaping up to be an exciting year for me professionally. This is my sixth year as a tenure-track academic librarian at the University of Saskatchewan and, as I type these words, my tenure file is making its way through the various campus committees. If all goes well (i.e. my tenure is awarded! ), I will be eligible for my first sabbatical as of July 1st, 2015. Of course, administerial planning for such things has to happen many months in advance, so I was composing my sabbatical application back in September 2014. As it happens, I was working on the application the same day that Kristin Hoffmann’s Brain-Work blog post, Taking Time for Research, came out. The post described her recent sabbatical experiences and highly recommended the experience to all researching librarians lucky enough to have the opportunity. Well, the timing certainly felt auspicious! This key bit of wisdom came from one of the first articles I stumbled across. Thanks to my application, I already have a broad outline of my sabbatical research project, and a smaller related project. However, I think I’ll also try to get some preliminary work underway this spring so that I waste no time and hit the ground running as of July 1st. This was #10 from a top ten list of sabbatical tips for junior faculty. Many of the other tips were useful too, but this one really resonated with me. I am not planning any extended travel and am hoping to get a workspace on campus during my sabbatical… but I know it is likely that I’ll also often work from home – because I can! And also, on the dark and frigid days of a Saskatchewan winter I know I will not want to leave the house if I don’t have to. So… how to stay motivated and productive from home? The thought of staying in my pajamas all day is appealing, but getting dressed and keeping to a schedule seems like a good strategy to maintain focus. This tip comes not from the Google oracle, but from an equally wise colleague of mine: Vicky Duncan. A research journal is useful for keeping track of your evolving research projects, insights and epiphanies, and any methodology decisions you make along the way…and why you made them! Seems to be a good idea for researchers in general (not just sabbaticants). However, I think a journal might be especially useful next year since I intend to spend a good portion of my sabbatical time reading deeply and simply thinking about what I’ve read. Lately, I often find myself just skimming research articles in a few spare minutes I have here and there during the day. So I am eagerly anticipating having the time and mental space to thoroughly immerse myself in scholarly literature. I can already anticipate the result of this though: an extended time period where I have no obvious products. Keeping a daily research journal of my reading, and the ideas that emerge, will be a nice reassurance to myself that I am making progress and have accomplished something. A good tip to end on. A burnt-out academic cannot contribute much to their institution or discipline. I must admit that the first six years on the tenure-track, in a new profession, have left me just a little *tired*. This sabbatical leave is coming at an ideal time. A time when I am passing a significant hurdle in my professional life (if all goes well! ), a time when I’m growing in confidence as a researcher and am eager to really concentrate on a substantial project, and a time when I feel I need a change of pace… to step back and take a breath. Well, these are some of the best tips I’ve collected so far, I’m sure there is a lot more advice out there. If you have a nugget of wisdom to contribute to the list please leave a comment below! Usually I have to make time for research in my daily work life. This past year, I was fortunate to be able to take time for research by going on a sabbatical leave. I highly recommend a sabbatical for any librarian who has the opportunity to take one. In a study conducted by Leona Jacobs of the University of Lethbridge and presented at the 2007 CLA conference, librarians who had taken sabbaticals said that their experience was “refreshing,” “fabulous,” and “energizing.” They also said that it was “hard work but … quite interesting.” My sabbatical experience was definitely all of those things! A sabbatical is a good time to really delve into an area. I had done a research project related to the development of librarians’ professional identity, and I knew that I wanted to continue to focus on professional identity. As I was thinking about possible professional identity-related projects, I kept telling myself, “I’ll need to do more background reading before I can write my application.” Finally I realized that I could use the sabbatical to do the background reading. That was a good choice: I now have a much fuller sense of my research agenda, and I feel more like a ‘real’ researcher, knowing that I have such an intimate familiarity with my research areas. A sabbatical is also a good time to try something new. I focused on research areas that weren’t new to me (librarians as practitioner-researchers, as well as professional identity), but my previous research had been with qualitative or quantitative approaches and during my sabbatical I wanted to try synthesizing my background reading with a critical/theoretical approach. It was a big stretch for me—my undergraduate education was in Engineering Physics—and it was frustrating and difficult at times, but I felt like I had really achieved something by breaking out of my research comfort zone. Know your work style and make sure you can work that way on sabbatical. For me, this meant that I needed to have people with whom I could talk about my research, because I often develop my thoughts much better through conversation. Working with co-researchers was one way I did that, and I am fortunate to have a partner who is an academic, was also on sabbatical, and is interested in my research. I also attended conferences where there was a fit with my research interests, and had some great conversations with conference presenters and attendees. Doing research is one of my favourite things about being an academic librarian, and the chance to focus on research during my sabbatical was wonderful. I learned a lot about myself as a researcher, and as a librarian. If you have taken a sabbatical, how did it affect your research? If you are planning one, what are you hoping to achieve with your research?